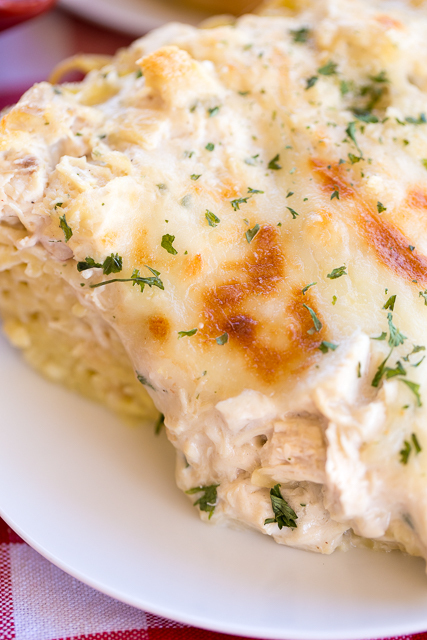 Chicken Alfredo Spaghetti Pie - a great twist to traditional spaghetti pie! Chicken, Alfredo sauce, spaghetti, eggs, parmesan cheese, mozzarella. SO good! Everyone raved about this pasta casserole!! Can make ahead and refrigerate or freeze for later. Spaghetti night is one of our favorite nights of the week. We love to make Spaghetti Pie. I was thinking of a way to mix up our usual spaghetti pie and thought why not use chicken and Alfredo sauce instead of beef and red sauce. O-M-G! SO good!! 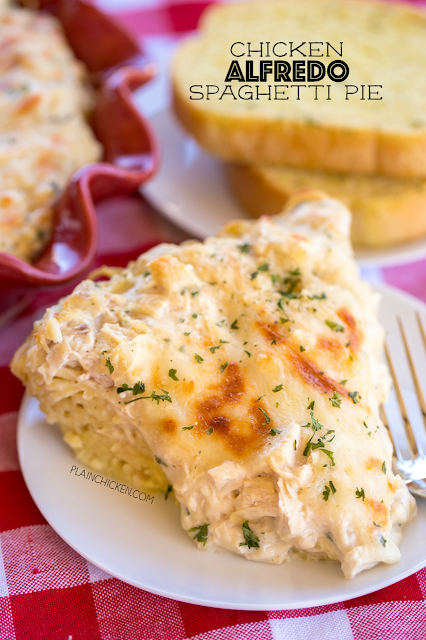 All you need is some garlic bread and a salad and you have an amazing weeknight meal!!! I used rotisserie chicken and some refrigerated Alfredo sauce for this dish. It can be assembled ahead of time and refrigerated overnight. I baked the pie and then popped it under the broiler to get the cheese a little brown. We ate this for dinner and lunch the next day. It was just as good reheated as it was hot out of the oven. Give this a try for your next spaghetti night! I promise you will LOVE it!! Preheat oven to 350ºF. Lightly spray a 9-inch pie plate with cooking spray. Set aside. Cook the spaghetti according to package directions. Drain and place in a large bowl. Toss pasta with egg and 4 Tbsp Parmesan cheese. Press the spaghetti mixture on the bottom and up the sides of the pie plate. Stir together chopped chicken, Alfredo sauce and 1/4 cup mozzarella cheese. Spread over spaghetti. Sprinkle remaining mozzarella and parmesan cheese on top. I am a little confused about the recipe. It mentions cottage cheese, but it's not listed in the ingredients, nor is "meat sauce". Olive Garden had something similar to this on their menu for a limited time last spring I think. OMG it was to die for. I will definitely be trying this recipe! Thanks! Would this be good as a make ahead freezer meal? I'm always looking for recipes that can be made up and frozen before cooking. My daughter has a brand new baby and I'm trying to stock her freezer! Should I cook the pie before freezing? Either before or after cooking is fine. I usually freeze casseroles uncooked and thaw and bake as directed. Perfect! My teenager won't eat regular spaghetti (red sauce), but we love the white sauce pizza at our local pizza place, so I've been thinking about making a pasta dish with alfredo sauce. This looks perfect - thanks! What brand of refrigerated Alfredo sauce did you use? Thanks for your help.